Product prices and availability are accurate as of 2019-04-19 04:01:14 UTC and are subject to change. Any price and availability information displayed on http://www.amazon.com/ at the time of purchase will apply to the purchase of this product. 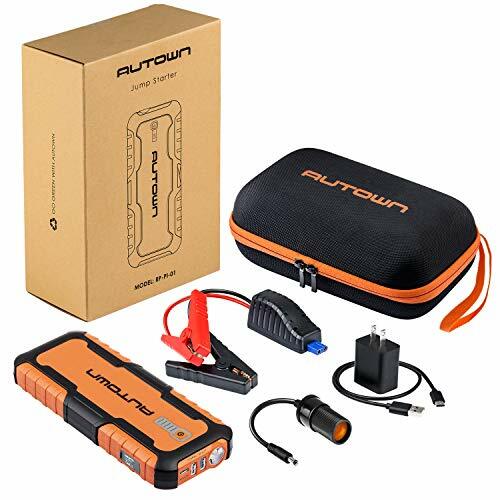 AUTOWN Jump Starter 21000mAh Capacity & 1000A Peak Current AUTOWN Portable Jump Starter is an ultra-safe, lightweight and compact lithium-ion jump starter for 12-volt batteries. This battery charger has a ablity to emergency restart all vehicles for up to 40 times. The quick charge 3.0 USB can up to 4 times faster than normal charging. Especially for adventure,outdoor,camping,travel,etc. 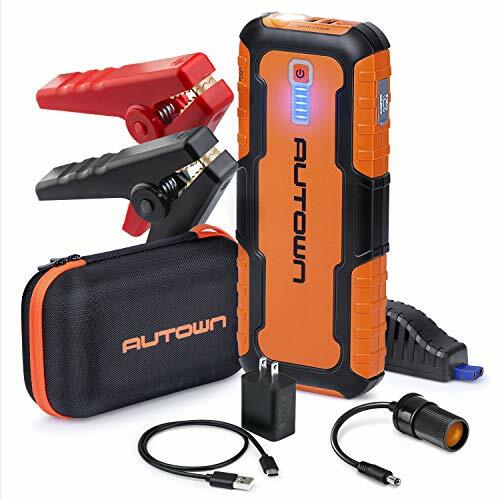 Other commonly used search terms include: car jump starter, battery jumper, car starter, autown jump starter, car battery jump starter,car jumper,jump pack, car jump, jump starter power bank, battery booster, battery jump, jumper pack, jumper battery, battery jump pack,portable jump starter, jumpstart, jumper starter, battery jump box, jump starters, booster pack, portable car battery jump starter,jump starter pack, jumper box portable power,jumper box, jump starter kit, jump battery, jumper starter diesel, diesel jump starter. Specifications Battery Capacity: 21000mAh(77.7Wh) Starting Current: 600A Peak Current: 1000A Full Charging Time: About 4-5 hours Operating Temperature: -20?~60? Input:Type C Quick Charge 3.0 (5V-2A;9V-2A;12V1.5A) Output 1 (blue usb):Quick Charge 3.0 (5V-2A;9V-2A;12V1.5A) Output 2(white usb):5V2.1A, 12V/10A LED Flashlight:4 modes of LED light - Normal, Strobe, SOS, Off Package 1 X AUTOWN Jump Starter 1 X Cigarette Lighter Adapter 1 X Smart Protection Clamps 1 X USB Charging Cable 1 X AC Power Adapter 1 X Warranty Card 1 X Portable Box 1 X User Manual Order Your Car Jump Starter Today and Start Realize the Benefits Immediately. Click "Add to Cart" Now!
? POWERFUL & FULL CAPACITY ?The Jump-Start Portable Power Pack Compact, yet powerful LITHIUM JUMP STARTER rated at 1,000 Amps. 21000mAH ( 77.7Wh ) Sufficient capacity, 100% Not false - UP TO 35-40 TIMES jump starts on a single charge. ? MEET ANY OF YOUR NEEDS ? The Portable Jump-Start Power Pack : A. Designed for gas engines up to 6 liters and diesel engines up to 3 liters for a car, suv, boat, truck, lawnmower and more. B. Built-in Type C Input that 2 times faster than other 2.1 A IN, and features a Quick charge 3.0 and a 2.1A USB port output battery pack - up to 4 times faster for QC 3.0 devices. 21000mAh FULL CAPACITY & Dual usb port Enough to recharge your personal devices, like smartphones, tablets, e-watches and more. ? NEW DESIGN FOR 100% SAFETY ? Our aim : 100% safety for each user, so we invested heavily in security research and development. New intelligent all-metal spray gold clamps with mistake-proof jumper cable, spark-proof. 5 advanced technical support, inlcuding short circuit protection, over current protection, overload protection, over-voltage protection, over-charge protection. ? ULTRA-BRIGHT FLASHLIGHT WITH SOS ? 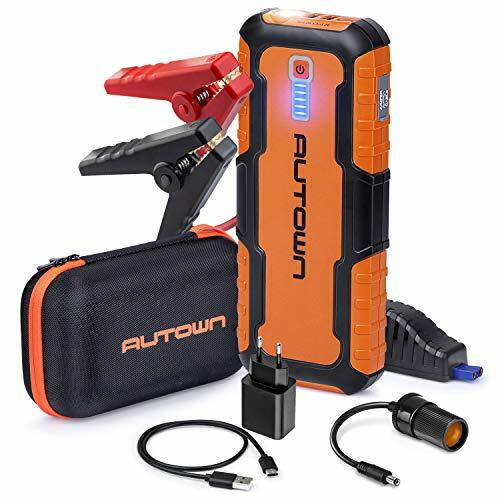 Ultra-bright 100 lumen LED flashlight, Whether you need light to change a tire, inspect an engine, or need to warn oncoming traffic that you are broken down on the side of the road, the ultra-bright LED flashlight in AUTOWN have you covered, They are including SOS and emergency strobe. ? 100% MONEY BACK GUARANTEE ? We stand the quality of our UltraSafe Lithium Jump Starter.Our aim: 100% satisfied customers. 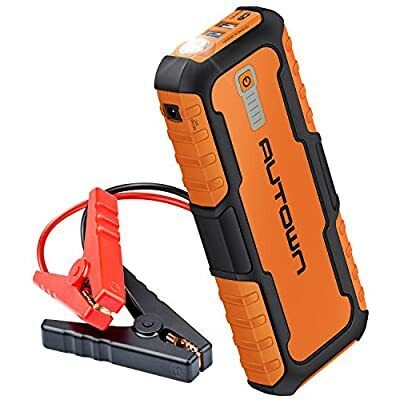 However, if you're not happy with your AUTOWN JUMP STARTER, you can return it anytime and get a full refund.